Ashley Dean of Broken Pixel talks about his production of the fab Fraggle Rock inspired video for Our Broken Garden's latest single Garden Grow, out now on Bella Union. Read on to find out how it was made. 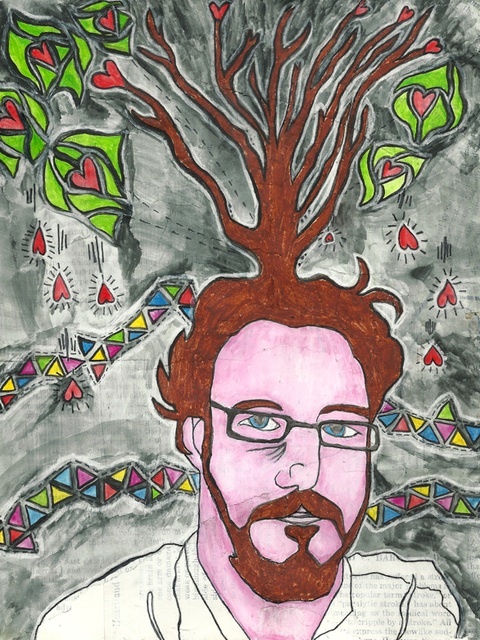 Ashley Dean, adiposity as depicted by Russty Brazil. What inspired the treatment for the video? The starting point for this video was a suggestion by Simon Raymonde of Bella Union. He said he’d love to see Anna of Our Broken Garden performing in a Muppet Show style set. It was this video that inspired him, so we started off from there… I love the Muppet Show, but my favourite Jim Henson creations are Fraggle Rock, The Dark Crystal and Labyrinth. They were big inspirations for the look of this video and it was a challenge to do justice to these great fantasy works, but lots of fun at the same time. The little beasties are great… where did you get the idea from them from? The three main puppets (the Spider, the Bird and the Tree Beast) were based on the Guitarist, Bassist and Drummer from Our Broken Garden; Søren, Moogie and Poul. My collaborator, Kevin Roper did some great concept sketches of the guys as animals and we ended up making the models pretty close to those original drawings. The little white things in the mines (we called them ‘Pale Moles’) were inspired by the Doozers from Fraggle Rock. I wanted to create a rich and detailed world for Anna to perform in; these creatures were a another layer of the eco-system, and an excuse for me to do some animating..! The video for Garden Grow by Our Broken Garden. Who made the little knitted spider monsters? The jumper that the Spider wore was knitted by my Mum over 20 years ago! I thought it would look great on Søren so Kev cut it up and re-made it with 8 sleeves. I sculpted Søren’s face in clay and cast it in latex, then we used all kinds of techniques to bring the puppets to life. I like to use recycled materials in my work; Moogie is a big bundle of old clothes coated with feathers from a discarded pillow. How did you make the video, and where was the studio set? We worked in a old flax mill in Leeds called Temple Works. It is an amazing, vast place and they have big plans for the future of it. It took myself, Kevin and my parents a week to construct the set. The trees took a long time, with Kev spending several days coating the skeletons I made with wall paper paste and brown paper. We bought out the entire stock of gaffer tape at the local Maplin, I think we got close to consuming a mile of the stuff! On the last day of the set build, Graham Pilling from Army of Cats came to the set and painted the background scenes then my wife, Lydia helped me finish everything off on a final, exhausting Saturday. There were so many details that had to be designed and manufactured on site, I was amazed when we were finally ready to light and shoot the video! I brought in Danny North to be Director of Photography (a long time collaborator with Amelia’s Magazine:Ed) and Tim Blackwell was my assistant director and puppeteered Søren. My parents were in charge of the catering. There was a great community feel during the whole process. What was it like to work with Anna? Anna Bronsted came over from Denmark to star in the video. She was a pleasure to work with and was willing to try out any of the shots and effects we had planned. We she feints amongst the apples, she is leaning against a step ladder that I gradually let fall backwards… That required a lot of trust from Anna and there are a lot of out-takes where I was a bit too enthusiastic with the simulated fall. Any funny stories from the shoot that you can tell us about? 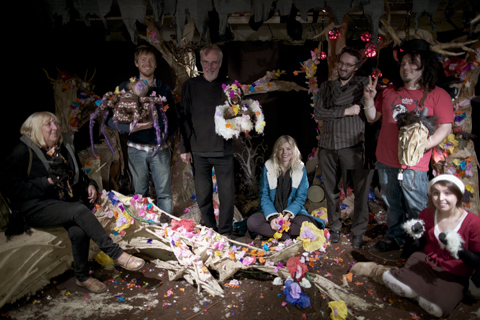 The whole ‘Garden Grow’ crew on set with Anna Bronsted of Our Broken Garden. Do you have any plans to work with Our Broken Garden again? I would love to. It will depend on both our schedules, but the rest of the album is great and Anna is a fantastic creative force to work with. She did mention that she wanted to make some more trees and characters to take with her on tour, but they will have to be a lot less fragile than the ones we made for the shoot! You used to be in iliketrains, which I love (and were featured in the printed version of Amelia’s Magazine many a moon ago). Why did you leave the group? Are you still making your own music? What other stuff are you working on with your company Broken Pixel? My next project is with Napoleon IIIrd. We are going to make some crazy, mashed-up projections using all kinds of old technology. I’ll be trying to bring my Super8 projectors back to life and we’ve got some old OHPs to play with. It should be a fun day out. I’ve got a couple of long term film projects in production and I’m always interested to work with new bands. I recently got a part time job as a chocolate taster (seriously!) and I’m about to launch a range of miniature sets, built into the back of canvases and inscribed with a fragmented, intertwined narrative. You can catch Our Broken Garden live in London on Thursday 17th November 2010: listing here.